Mary Fancher as the club’s 2017-18 Paul Harris Fellow award recipient. Paul Harris Fellowships are given to recognize exceptional contributions made by individuals who further Rotary's mission of encouraging the ideals of service as a basis of worthy enterprise, high ethical standards, community service, and the advancement of international understanding and goodwill. The Fellowship, named for Paul Harris who founded Rotary in 1905, was established in his honor in 1957 and is usually reserved for individuals who contribute $1000 US to the Rotary Foundation. Mary Fancher's enthusiasm, planning and organizational skills have enabled the students in the Interact Club to broaden themselves and serve their school and community. The Interact club student members follow Rotary's principles of service and fellowship while advancing worthy causes at the school. The club has participated in the Rocky River homecoming parade, hosted welcoming parties for new students at the school, and represented their club at district events. 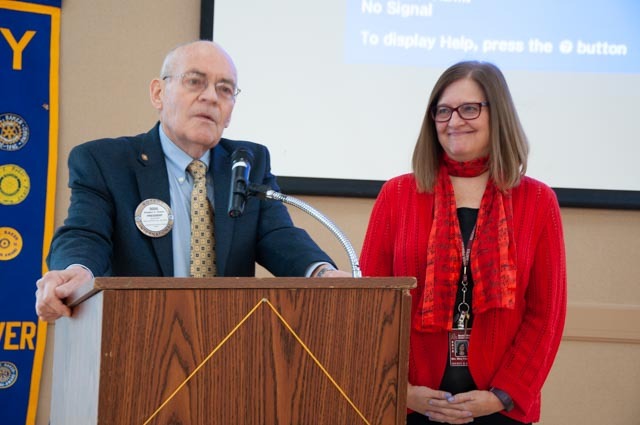 Fancher received the award December 6 at the Rotary District 6630 Foundation Celebration held at Windows on the River. The award was made possible due to the local Rotary club’s achievement of having every member donate to Rotary International’s Annual Fund during the 2017-18 Rotary year. Gifts to the Annual Fund helps Rotary clubs take action today to create positive change in communities at home and around the world. Contributions help strengthen peace efforts, provide clean water and sanitation, support education, grow local economies, save mothers and children, and fight disease.